The Basic dog door is a Freedom Pet Pass door simplified down to only the essentials: the hyper-efficient DoubleMag flap system on a flat, mountable frame. It’s perfect for special projects and advanced DIYers. Too big is better than too small – if a dog has to squeeze through an opening, it can put dangerous stress on his or her back and knees. Size for your tallest dog – buy and mount the door for your tallest dog, and make accommodations to assist smaller pets. For tall dogs, the door should be off the floor – most dogs lift their feet up when the walk, naturally going through a door several inches off of the floor with ease. If you’re not sure, do some testing – we suggest performing a simple simulation at home so you can quickly and easily see how well your dog will react to any of our doors. Pet Opening – The smallest opening through which your dog will have to pass when using the door. This dimension is used for properly sizing the door for your dog. 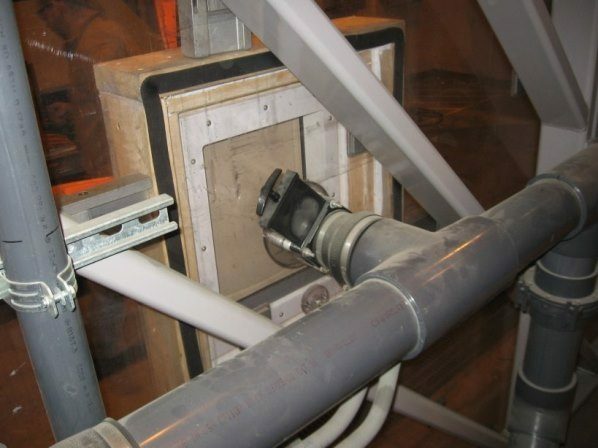 Minimum Rough Opening – The minimum size of the hole in your project needed to accommodate the Freedom Pet Pass dog door. Your opening can be up to 1” (25 mm) wider and up to 2½” (60 mm) taller than the minimum measurements. 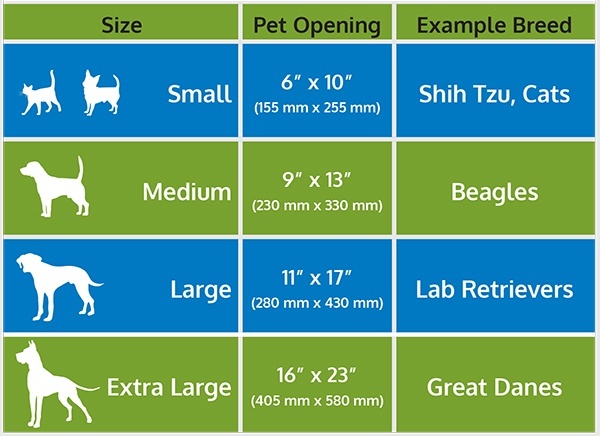 Frame Size – The overall size of the frame on the pet door; the footprint of the dog door on your project. In-stock doors ship same day*. Your order will be shipped from our production facility in Bay City, MI, and it will be delivered directly to your home with no additional fees or delays**. Below is a map with estimates for Ground Express shipping (recommended). Air shipping is available for guaranteed Next Day and 2-Day deliveries. Free shipping may add 1-2 days to the estimates given below, Canada Post may add 4-5 days. Installation of a Freedom Pet Pass basic dog door can be as simple as screwing the door over the opening in your project. It can also be more difficult than that, it all depends on your project. Because basic dog doors can be used in a huge variety of different types of projects, limited instructions are provided. We recommend this door for people with substantial DIY skills or pros. Freedom Pet Pass dog doors are engineered to last for years and years with minimal maintenance and come with a 3-year limited warranty against malfunction due to manufacturing or material defects. If you’re having any problems at all with your door, don’t hesitate to contact us, whether your door is in warranty or if you’ve had it for 10+ years. We’re here to help for the lifetime of your dog door. Most doggie doors are extremely leaky, which leads to cold, drafty rooms and high energy bills. In fact, over 90% of the energy loss from conventional pet doors comes from air leakage – letting cold air directly into your home. The Freedom Pet Pass dog door with DoubleMag seal is virtually airtight, so it keeps winter air outside where it belongs. The cellular PVC used in our frame is 3,000X more insulating than the aluminum material used in the frames of lesser doggie doors. 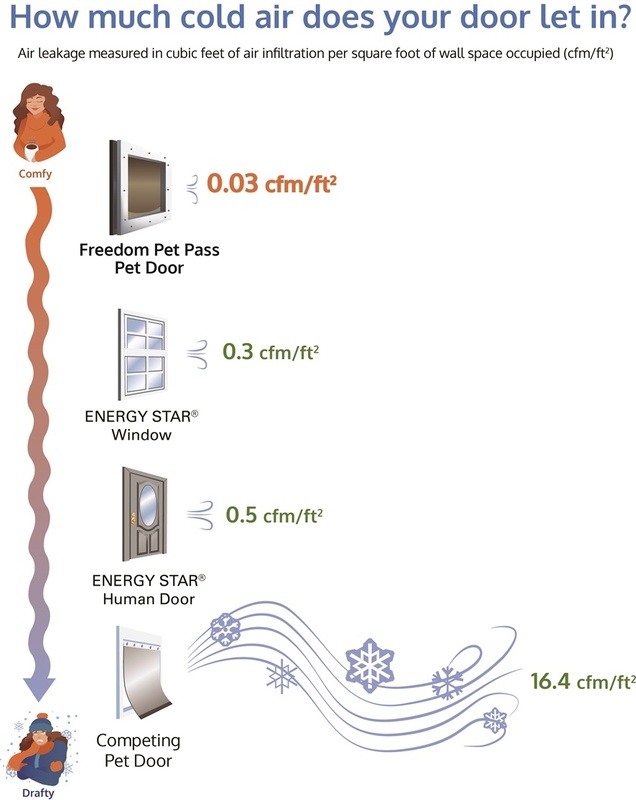 Many dog doors “claim” energy-efficiency with bogus comparisons and no proof. Freedom Pet Pass dog doors have extensive independent laboratory testing that prove how efficient they are. Our doors are evaluated using the same tests that are used for Energy Star certification for windows and human doors, and the results show that Freedom Pet Pass doors are 15X better at blocking outside air than Energy Star requirements for human doors and windows. Cellular PVC Frame – Strong, weatherproof, and mold-resistant, and 3,000X more insulating than metal frames used on lower-end dog doors. Is the Basic door as efficient and high-quality as other Freedom Pet Pass doors? Basic doors have the exact same insulated DoubleMag flap system and airtight seal as Freedom Pet Pass door-mounted or wall-mounted doors. Cost savings compared to our other doors are achieved from lower material and labor costs because of the simplified frame and lower shipping costs from the packaged product being smaller. We did NOT sacrifice performance or quality with our Basic doors. How hard is it to open the dog door? Pretty much any dog or cat has the physical capability to open a Freedom Pet Pass pet door. If your pet can push open an unlatched interior door, he or she is capable of using a Freedom Pet Pass dog door. 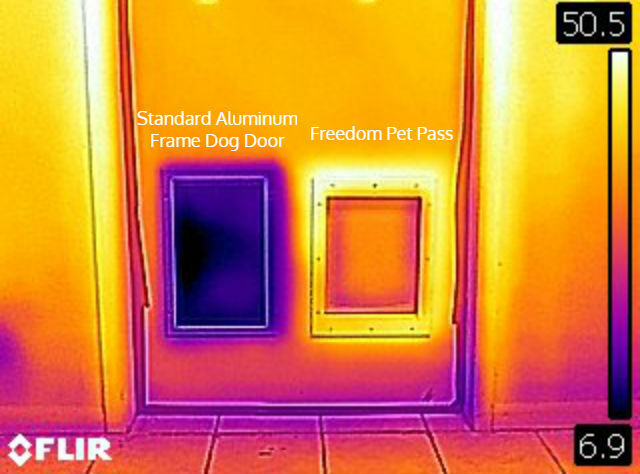 The opaque, insulated, and airtight flap system on the Freedom Pet Pass door means that inside light, smells and temperatures stay inside where they belong. It is certainly possible to install a basic Freedom Pet Pass dog door into glass, but there are challenges inherent with making holes in glass. We do not provide any specific guidance for this, and we recommend contracting with a professional glass contractor. Other Freedom Pet Pass doors have flap color options. Can I get a different-color flap for my Basic door?